Dear Friends of mine, recently retired to Pine Knoll Shores, on the Crystal Coast of North Carolina. They worked their entire lives to scrimp, save and plan. Life attempted to derail their retirement but they were clear on their vision of the future and a full-time home on the coast was the plan. It was horrible to have them leave Holly Springs, we had grown very close and I was losing a personal friendships but we did not lose the friendship, just are living a bit farther apart. A few weeks ago, I went down for a visit to clear my mind. It was just like we had never been separated, still as close as we ever were, impeccable hospitality. Talk, wine, beach walking, touring the town, eating scrumptious food, talk and more wine. The perfect rejuvenation I needed. As a token of my appreciation, I sketched their home for notecards. They were elated with the surprise gift of their Costa Nido (Coastal Nest). 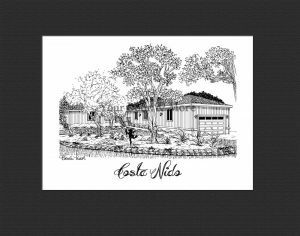 Allow me to sketch your vacation home, current home or past home. Memories can’t be replaced but my heirloom sketches help you remember. Email me!